At one point or another when you’re traveling, you’re likely going to need to rent a car or some other type of vehicle to help you get around. Whether you’re just planning on taking your next big road trip, attending a business meeting or conference, or staying out of town for an extended period of time for work, renting a car is often the best solution to your mobility problem. However, the world of rental cars requires a whole lot of research, especially if you’re hoping on finding the best rates, as well as ensuring that you and your rental vehicle are safe while driving around. This is because, when you search on the internet, there are literally hundreds of different car rental agencies and booking portals to choose from. Fortunately, we’ve scoured the internet to find you the 5 best car rental services. So, whether you’re planning to hit the road for business or for pleasure, or even if you just want to treat yourself to a ride in a luxury vehicle, there’s guaranteed to be something on our list for you. Keep scrolling to find out about the top 5 best rental companies, that offer the most value for your money. The service isn’t an actual rental company itself. However, they work with car hire companies everywhere in the world to help find you the best selection and deals, which can make a whole world of difference during your travels. The company’s website claims that they’re willing to do just about anything to find you the best rental vehicle, which gives you the ability to discover wherever it is that you want to go. All in all, they offer a seamless and hassle-free rental experience from searching and booking through to picking up and dropping off your vehicle. The only negative thing I can say is that I was able to find a lot negative reviews about this company online. Although it’s impossible to keep all your customers happy all the time, I’d recommend reading through the company’s reviews before booking with them. Enterprise is one of the most well-known names in the car rental industry. This means that the company is one of the best out there. However, this also means that they are one of the more expensive providers, with daily rate averaging in around $50 per day. However, one good thing about Enterprise is that they do away with a lot of the small, additional charges that most of the other rental companies sneak onto your bill without you knowing. Enterprise is an extremely convenient rental company to deal with and has roughly 6,000 rental locations in the United States alone. Also, if you plan on staying somewhere or renting a vehicle for an extended period of time, they offer special rates for monthly rentals, which offers more savings the longer you rent for. Furthermore, Enterprise offers a surprisingly wide range of exotic, luxury cars to choose from. So, if you’re planning a special occasion during your travels, Enterprise might be the best choice for you. 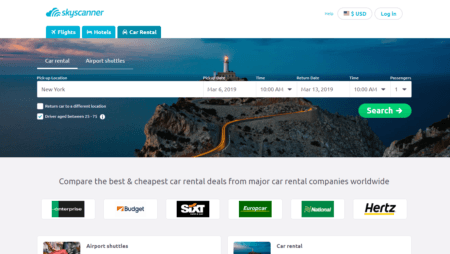 Skyscanner is another company that isn’t a rental company, but rather a booking agency that helps find you the best deals in the industry. By making a single online search with Skyscanner, you’ll instantly be able to compare hundreds of rental prices near your location or wherever it is you plan on traveling. Furthermore, they have hundreds well-known partners, such Enterprise, Hertz, and Expedia, as well as thousands of locations around the world, giving you a wide range of choices to help find you the best deal for your trip. The service is quick, easy, and reliable, and the best part is that you can also use Skyscanner’s services to find the best deals on flights and accommodations at the same time. Priceline is another booking portal, which can help you save up to 40% on your next vehicle rental. They are trusted everywhere and have served more than 8 million travelers worldwide. Priceline has more than 290 partners, including some of the biggest names in the industry such as Alamo, Avis, Budget, National, Thrifty, and many more. With locations around the world, they offer access to roughly 18,500 vehicles and guarantee some of the best deals and prices you’ll find. This is another one of the biggest and most well-known names out there. They have more than 1,600 airport locations in the United States, as well as thousands more located around the world. However, with an average rate of about $48.50 per day, they are certainly not the most affordable rental service out there and are comparable to renting with other big companies such as Enterprise. Still, Hertz has a surprisingly huge selection of vehicle to choose from. While they obviously have plenty of affordable, budget-friendly economy cars, as well as business-class models, they also offer a wide range of luxury vehicles, such as hybrids and luxury-class, dream cars as well. Another extremely helpful feature offered by Hertz is their “NeverLost” GPS system, which allows the company to keep track of where all their vehicles are at any given time. But it’s not just a GPS tracking device, it also gives you access to a trip planner, which can be downloaded and uploaded to your GPS device, as well as a concierge service to help you plan your route and a few other nifty features such as city and national park guides. Planning on Renting a Car? 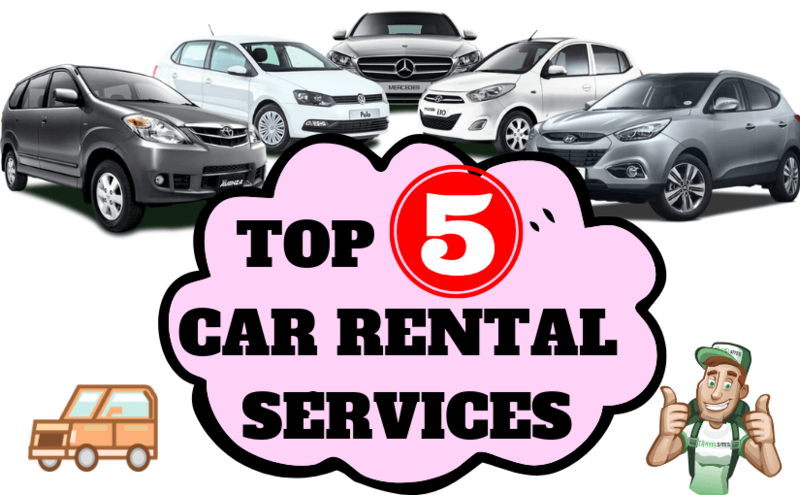 While searching online for car rental services can seem stressful, mainly due to the vast amount of options out there, finding the best deals doesn’t have to be an overwhelming task. By using these 5 rental car services, you’ll easily be able to compare prices from hundreds of rental companies and find the best deal and the perfect car for your next big adventure.